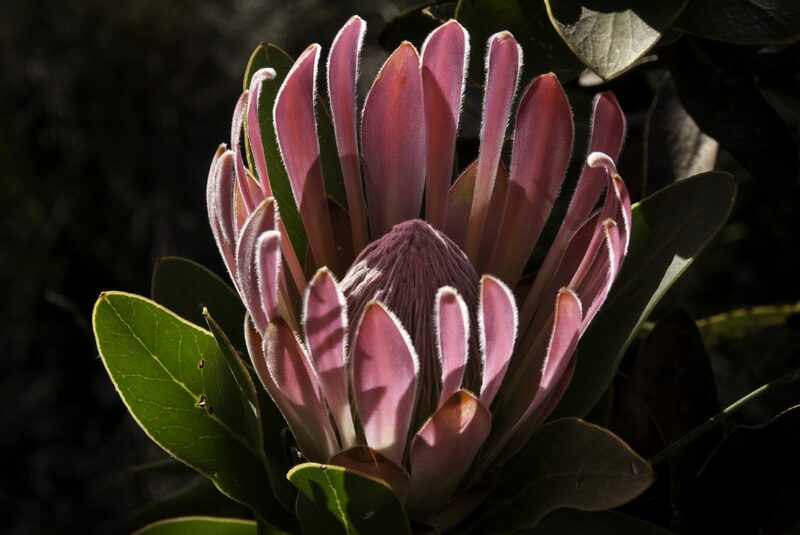 The beauty of our fynbos from CapeNature on Vimeo. Kristen Nolting (@KristenNolting on Twitter) pointed me to this video. Thanks, Kristen. In the past 15-20 years, conservation biologists have become increasingly aware that successful conservation efforts require the support and involvement of local communities, but only more recently have we become fully aware that getting that support and involvement requires that we pay attention to what communities need, not only to what we want. Reducing economic inequality, and in particular improving the lives of those in poverty, is not only the right thing to do on its own terms. It’s the only way we can protect the natural systems we can care about in the long term. In Fall 2015, I discussed some of these issues in my graduate course in conservation biology. The problem is that it’s easy to say the “right” words and to congratulate ourselves for our wisdom and generosity. It’s harder to see how the attitudes those of us who live in relatively prosperous communities are influenced by the economic privileges we have. Those privileges are part of the reason it’s hard for us to understand farmers, ranchers, and oilmen who seem to have little regard for the land. I grew up among farmers and ranchers in southern Idaho, and the people I knew care as deeply about the land as I do. The difference? They draw their livelihood directly from the land, and their livelihood is less secure. Not unreasonably, they focus on immediate needs,1 not far-off benefits. The main thing I took away was that, when it comes to issues that are controversial (including climate change or biodiversity preservation), approaching those who might oppose ecologists with an understanding of my own privilege and how it differs from the background of others can help me to open myself up to innovative solutions, instead of imposing my beliefs on others. If you teach a course in conservation biology, I encourage you to read Holly’s article and use some of the ideas in it the next time you teach your course. Last week I pointed out a new paper by Denes Szucs and John Ioannidis, When null hypothesis significance testing is unsuitable for research: a reassessment.1 I mentioned that P-values from small, noisy studies are likely to be misleading. Last April, Raghu Parthasarathy at The Eighteenth Elephant had a long post on a more fundamental problem with P-values: they encourage binary thinking. Why is this a problem? “Binary statements can’t be sensibly combined” when measurements have noise. Those brief statements probably won’t make any sense,2 so head over to The Eighteenth Elephant to get the full explanation. The post is a bit long, but it’s easy to read, and well worth your time. Andrew Gelman recently linked to Parthasarathy’s post and adds one more observation on how P-values are problematic: they are “interpretable only under the null hypothesis, yet the usual purpose of the p-value in practice is to reject the null.” In other words, P-values are derived assuming the null hypothesis is true. They tell us what the chances of getting the data we got are if the null hypothesis were true. Since we typically don’t believe the null hypothesis is true, the P-value doesn’t correspond to anything meaningful. To take Gelman’s example, suppose we had an experiment with a control, treatment A, and treatment B. Our data suggest that treatment A is not different from control (P=0.13) but that treatment B is different from the control (P=0.003). That’s pretty clear evidence that treatment A and treatment B are different, right? Wrong. P=0.13 corresponds to a treatment-control difference of 1.5 standard deviations; P=0.003, to a treatment-control difference of 3.0 standard deviations, a difference of 1.5 standard deviations, which corresponds to a P-value of 0.13. Why the apparent contradiction? Because if we want to say that treatment A and treatment B, we need to compare them directly to each other. When we do so, we realize that we don’t have any evidence that the treatments are different from one another. It’s absurd to think that anything exists in isolation, or that any treatment really has “zero” effect, certainly not in the messy world of living things. Our task, always, is to quantify the size of an effect, or the value of a parameter, whether this is the resistivity of a metal or the toxicity of a drug. We should be focusing on estimating the magnitude of effects and the uncertainty associated with those estimates, not testing null hypotheses. There is a common misconception that if you happen to obtain statistical significance with low power, then you have achieved a particularly impressive feat, obtaining scientific success under difficult conditions. Whenever researchers use NHST they should justify its use, and publish pre-study power calculations and effect sizes, including negative findings. Studies should optimally be pre-registered and raw data published. [M]ost scientists…are still near exclusively educated in NHST, they tend to misunderstand and abuse NHST and the method is near fully dominant in scientific papers. The whole paper is worth reading, and reading carefully. If you use statistics in your research, please read it and remember its lessons the next time you’re analyzing your data. Last July, the United States banned nearly all commercial trade in ivory. Last Friday, China announced that it will “end the processing and selling of ivory and ivory products by the end of March as it phases out the legal trade” (The New York Times). I haven’t studied the issue carefully, but I am not persuaded by their arguments. For one thing, Nitin Sekar and Solomon Hsiang point out in The Guardian that the limited legal trade in ivory established in 2008 seems to have increased the amount of poaching. 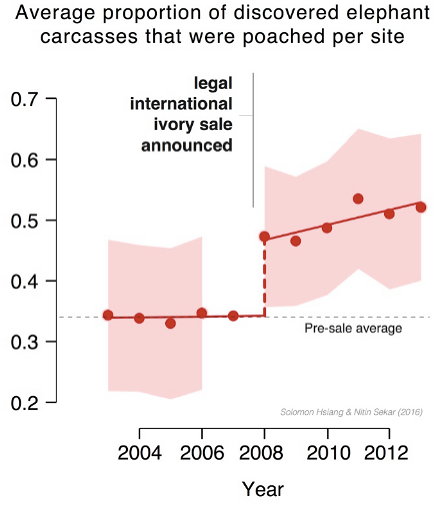 To be fair, with only 5 points from before the 2008 announcement of legal ivory sales and 6 points after, you’d be hard-pressed to demonstrate that a statistical model favoring a switch in poaching rates in 2008 is better than one where rates are simply increasing over time, but either way, the limited trade in ivory introduced in 2008 did not decrease the rate of poaching. Point 2 is undeniably true. Lifting Africans from poverty is the only way to make lasting progress on any conservation problem in Africa. But that observation argues for promoting policies that directly reduce poverty, like increasing sanitation, enhancing access to health care, and strengthening education. Elephant poaching has increased since 2008, and prices of ivory are high. Is there any evidence that incomes of Africans have improved as a result? If there is, Martin Rowan doesn’t provide it. That’s why I regard it as good news that China is shutting down its domestic ivory trade. A ban on the legal trade of ivory won’t shut down the black market, any more than a ban on cocaine in the US shut down the cocaine market here. But a ban on the legal trade of ivory will make it more difficult for black marketeers to hide. With strong enforcement, a ban will reduce the incentives to trade in ivory and the incentives for poachers.